It is a tough task to deal with acne scars. These are surely one of the most difficult marks that leave your skin with a big challenge to deal with. 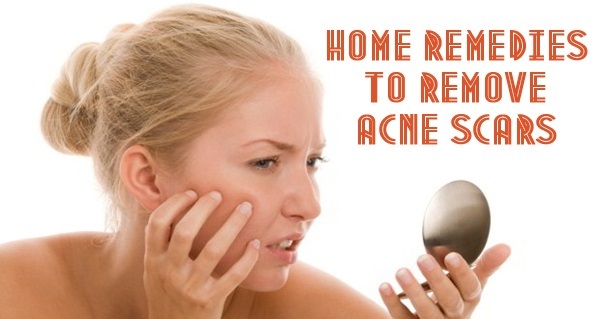 This article brings to you the top most 10 home remedies for dealing with acne scars. These are natural ways of removing acne marks. You can find these ingredients in your kitchen which can be made into some herbal packs that help removing these marks. Find out what these wonderful home remedies are. Vinegar comes with an impressive cleaning action. It keeps your skin free from dead skin and also helps in lightening pimple and acne scars. Mix apple cider vinegar in equal amounts of water. Use a cotton ball to apply this mixture on your acne scars. Leave it for few hours and then wash it off using warm water. Use it regularly to experience the results. Do not use vinegar without dilution; it can hamper your skin. Honey also works wonderfully on acnes and their marks. You can create wonderful masks and packs made with natural ingredients for a scare free skin. Prepare a healthy mix using honey and oatmeal. Apply this mixture on the scars and leave them for 15 minutes. Wash it off with water. Apply honey on acne scars at night. Allow it to stay overnight. Rinse it off in the morning. Add some cinnamon power to honey and apply this mix on the marks. Leave it on your skin for an hour and then wash it off. Lemon cleans your skin naturally. It is natural bleach which lightens marks on the skin on regular usage. Applying lemon juice on acne marks works wonderfully well by lightening them with every passing day. Squeeze the juice of a fresh lemon and apply it on the scars every day. This will lighten the marks. In case your skin is sensitive and you feel itching sensations on applying raw juice then you must dilute it by adding some rose water before application. Olive oil is marvelous oil which nourishes the skin with the goodness of vitamins, minerals and antioxidants. It is one of the best known oils for skin. It comes with anti-inflammatory properties which make are beneficial in removing acne scars. This simple application involves applying olive oil on the scars before going off to sleep. Gently massage it all over our face so that the oil is absorbed by your skin. Take a clean towel and dip it into warm water. Strain the water and put the towel on your face for steam. Wipe off excessive oil from your skin. Do not rub it. After few minutes, wash off your face with water. Raw potato is a readily available solution for pimple and acne scars. Though it is a little slow in showing results but regular usage of this vegetable can get you a clean skin free from scars. Slice the potato into thin rounds. Rub the slices on your facial skin in a circular motion. Keep rubbing it patiently till the time it doesn’t become dry. Repeat this exercise for about 15 minutes. Allow your skin to absorb the potato juice on your skin. Aloe Vera is one of the most beneficial natural herbs for skin. It comes with various amazing benefits for skin. From boils to repairing damaged cells, it acts beautifully on almost all kinds of skin problems along with acne scars. Peel the outer green cover of aloe vera leaf. You will find natural gel under the leaf. Use this healthy gel for application on scars. Allow the gel to stay on your skin for half an hour and then rinse it off. You are advised to apply this gel twice a day to experience a wonderful skin along with lightening of scars. Baking soda is a part of ever kitchen. Other than making your dishes tastier, it is also very helpful in removing acne scars from your skin through its exfoliating effects. It cleans your skin from all kinds of dirt thereby leaving you with a clean and clear skin. Mix baking soda in water to prepare a paste. Apply this paste on the scars and massage it well. After a gentle massage, leave the paste on the skin for some time. Moisturize your skin with some cream or preferably olive oil. Red raw tomatoes are a great source for helping lighten the pimple and acne scars of the face. You need to use them regularly to enjoy the healthy skin benefits. Take ripe tomatoes and crush them to make a pulp. Apply tomato pulp on your face. Leave it for 15 minutes. Rinse your face. Repeat this exercise daily for 2 weeks. You can also prepare a natural face mask by mixing the tomato pulp with the fresh juice of cucumber and avocado. Mix them well and apply it on your face. Leave it for 15 minutes and then rinse it with water. Oatmeal is very healthy for skin. It helps in scrapping away the dead cells from the skin and lightening the scars on your face caused due to pimples and acnes. Prepare an oatmeal scrub with water. Apply it on your face and rub it gently on your scars in a circular motion. Massage it for 10 minutes and then allow it to stay for some time. Ice works intelligently on pimple and acne scars. It is very effective in soothing your skin from irritation and inflamed scars. Soothe your skin with ice cubes by applying them over your acnes for 10-15 minutes on a regular basis. This will help the scar marks reduce gradually. In case, the cube feels too cold, cover it in linen and then apply it. All these natural home remedies work beautifully on reducing the scar marks caused by acnes and pimples.